Thermal spraying is an industrial coating process that consists of a heat source (flame or other) and a coating material in a powder or wire form which is literally melted into tiny droplets and sprayed onto surfaces at high velocity. This “spray welding” process is known by many names including Plasma Spray, HVOF, Arc Spray, Flame Spray, and Metalizing. Thermal sprayed coatings are typically applied to metal substrates, but can also be applied to some plastic substrates. 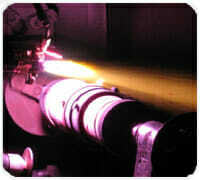 Thermal sprayed coatings uniquely enhance and improve the performance of the component. Thermal Spray is versatile and is an effective alternative. Thermal sprayed coatings can be an effective alternative to several surface treatments including: nickel and chrome plating, nitride or heat treat processes, anodizing, and weld overlay. They are typically thicker than plating, in the range of .002”-.025” thick depending on the coating material. This broad choice of materials give you design flexibility to solve specific performance problems. Electric wire arc thermal spraying utilizes the same principles employed in wire arc welding systems. The coating material, in wire form, is electrically charged, and then contacted creating an arc. The molten droplets of metal wire are then sprayed onto the substrate using a high velocity air stream to atomize and propel the material. Arc spray coatings are very cost effective and are typically used to apply metals like pure aluminum, zinc, copper, and metal alloys such as stainless steel. Arc spray also allows adjustments to achieve varied coating texture (200 micro inches – 800 micro inches). Flame spray, also known as oxy/acetylene combustion spray is the original thermal spray technique developed about 100 years ago. It uses the basic principles of a welding torch with the addition of a high velocity air stream to propel molten particles onto the substrate. The coating material can be either a wire or powder form. 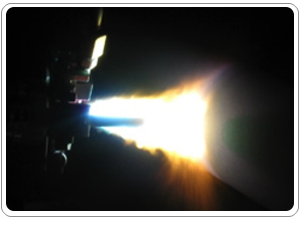 Often flame spray coatings are fused after being applied to enhance bond strengths and coating density. The plasma spray process (non-transferred arc), uses inert gases fed past an electrode inducing the “plasma” state of the gases. When the gases exit the nozzle of the gun apparatus and return to their normal state, a tremendous amount of heat is released. 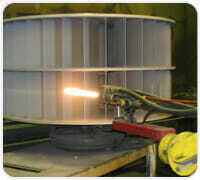 A powdered coating material is injected into the plasma “flame” and propelled onto the substrate. Ceramic Coatings are most often applied using plasma spray due to their high melting temperatures. (Often > 3500 F). 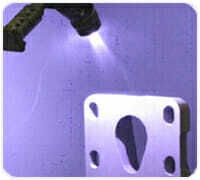 Several types of ceramic coatings can be applied using plasma spray. Ceramic coatings include Chrome Oxide, Aluminum Oxide, Titanium Oxide, and Zirconia. The HVOF (High Velocity Oxy-Fuel) process combusts oxygen and one of select group of ignitable gases including: propane, propylene, or hydrogen. Although the HVOF system uses the basic principle of combustion, the spray gun is designed differently than the standard oxy-fuel spray gun. The HVOF gun differences produce higher flame temperatures and higher velocities. The result is more thoroughly melted powder and more kinetic energy available to “flatten” the molten particles of coating material. The HVOF process produces superior bond strength and coating density. The HVOF process is most often used to apply high melting temperature metals and metal alloys such as: tungsten carbide, Inconle®, chrome carbide, Stellite®, and Tribaloy®. Carbide coatings include various Tungsten Carbide and Chrome Carbide materials. The plasma spray process (non-transferred arc), uses inert gases fed past an electrode inducing the “plasma” state of the gases. When the gases exit the nozzle of the gun apparatus and return to their normal state, a tremendous amount of heat is released. 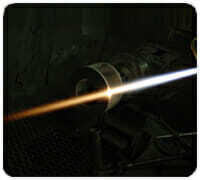 A powdered coating material is injected into the plasma “flame” and propelled onto the substrate.